It is 10 k.m. from the Giza Pyramids. It is 2 million square meters in the 6th of October City. It was established to be the Egyptian entrance to the twenty first Century. It is the Hollywood of the East with its studios. It has 18 T.V. studios equipped with the latest technologies and computer applications. 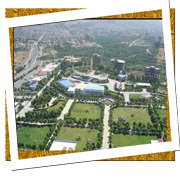 It has open areas and technical and production centers. It has Pharaonic, Islamic, Pop and coastal sites. It also has a conference hall , theaters , a movie theater complex and a five star hotel (Movenpick). 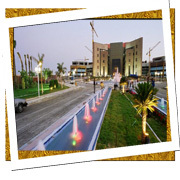 The Production city has a tourist entertainment park area (Magic land). It has a Dolphin show (the first in the middle East), a Dinasour park , open areas, an ice —skaiting ring and other amusement games. It is an Aqua park. 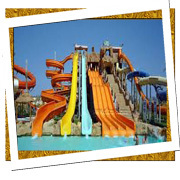 It is one of the first aqua parks in Egypt. It has a beautiful green park. It has video games , car racing, laser games and a chain of specialized restaurants and an Eastern corner. Kilo 10.5 Cairo .- Alexandria Desert road Entrance of the Shekheh Zayed city. It is a city in unique location overlooking the Giza Pyramids in a wonderful panorama. It is 8 k.m. from the "Rimaya" square in El Haram and it occupies 200 feddans. It has amusement centers for all ages, health and educational services. It has field for all sports including golf and a health resort with a large lakes and swimming pools. It is amusement park on the October — oases road. 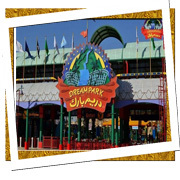 It is the largest amusement park in the Middle East. It is designed on Disney land style. It was established on an area of 200 Feddans. It has three main areas such as the condor, the river, the train and thirty three other games. It has the chain of eighteen restaurants. It has a main display screen of the village and a roman theatre. Many displayes are performed in that theatre. It also has an area for celebrations that can house more than 18000 persons. 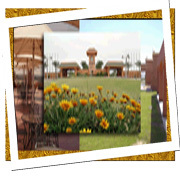 Soleimaneya Golf Resort situated in Km 55 Cairo Alexandria high way. · Golf club restaurant It has a terrace overlooking the swimming pool. It has also hotel for congresses, sport and wellness, extraordinarily designed swimming-pools excellent gastronomy, a supermarket and further services that form part of an urban infrastructure as well as the villas of residence, built in different architectural styles, all offer the guests and new inhabitants luxurious accommodation and a diversity of leisure entertainment.